I wrote a piece last week on my personal blog entitled Magazine Rant, detailing my love/hate relationship with periodicals and the ads that keep most of them afloat. As much as I complain, there are a few magazines I truly cherish: National Geographic, Smithsonian, and the one I’m featuring today, Fine Cooking. Fine Cooking has been my “go to” magazine for years, a reliable source of inspiration, tips, and the most delicious recipes imaginable. These days I use their website far more than my magazines, opting to print out pages that can be recycled after receiving splatters or spills in the kitchen. Months ago I signed up for their email newsletter and I typically get an email a day, offering suggestions for upcoming holidays or occasions, ways to use seasonal produce, and the like. Whereas most bulk email simply goes straight to the trash, I savor these emails from Fine Cooking as much as the food itself. I even have a dedicated “Fine Cooking Recipes” folder in my Inbox, so I can save any that pique my interest. And sometimes, like today, I go back and retrieve one for The Daily Dish. 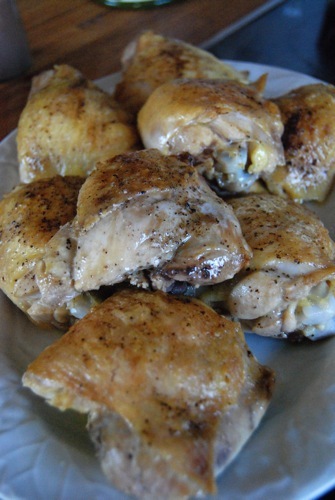 Today’s low sodium main course is adapted from Fine Cooking and takes advantage of bone-in, skin-on chicken thighs, one of the most affordable, meaty & flavorful cuts of chicken available. As the title attests, the meat is first seared on the stovetop, leaving the skin crisp and golden, then finished in the oven. After the thighs are removed to a plate, the sauce is prepared in the very same pan, leaving next to no clean up. And what a sauce! 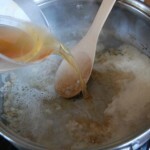 The amber beer broth is sweetened with a touch of maple syrup, thickened with a little flour and butter, and flavored with the tang of grainy mustard and sauteed shallot. It’s light, yet rich, and partners beautifully with the chicken. Garnish with extra fresh thyme for a real taste of spring! 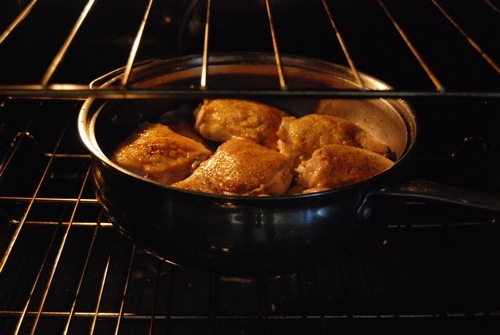 Position a rack in the bottom third of the oven and preheat to 475 degrees. Season the chicken thighs with freshly ground pepper to taste. Heat the oil in an ovenproof skillet over medium-high heat. Once the oil is hot, swirl to coat the pan bottom. 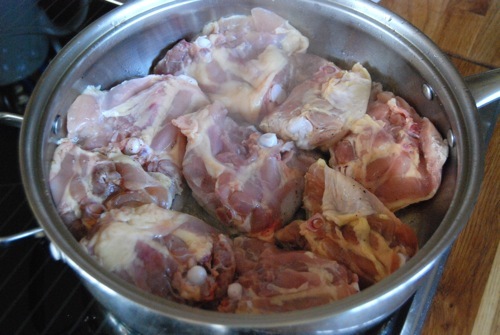 Arrange the chicken in the pan skin side down in a single layer (it will be a snug fit). Cover pan with a splatter screen if you have one. Cook until the skin is golden brown, about 7 minutes. Turn the thighs and transfer the pan to the oven. Roast until a thermometer inserted into the thickest part of a thigh registers 170°F, 5 to 8 minutes. Remove pan from oven (CAREFUL! HANDLE WILL BE HOT!) and transfer chicken to a plate. Reserve a tablespoon of oil from the pan, discarding the rest. Heat the oil in the skillet over medium heat. 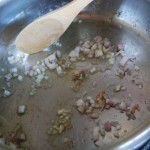 Add the shallots and sauté until softened, about 2 minutes. Add the flour and stir until combined. 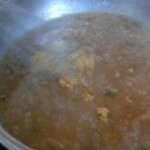 Stir in the beer, chicken broth, maple syrup and fresh thyme. Raise the heat to high and bring to a boil, scraping up any browned bits from the skillet with a wooden spoon. Simmer vigorously until sauce has reduced to roughly 1 cup, about 3 minutes. Remove pan from the heat and whisk in the mustard, then the butter. Season the sauce to taste with freshly ground black pepper to taste. 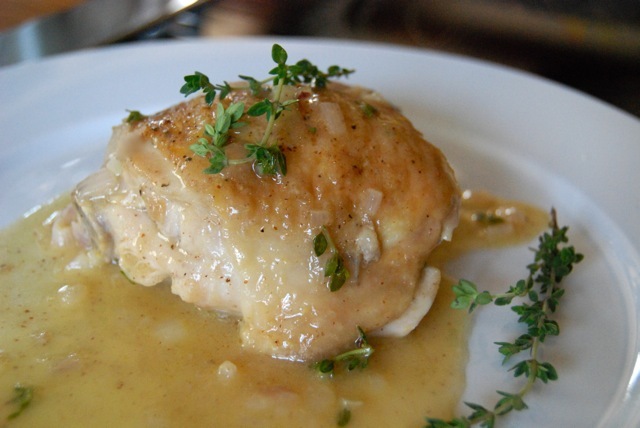 To serve, drench each chicken thigh in the sauce, turning to coat. 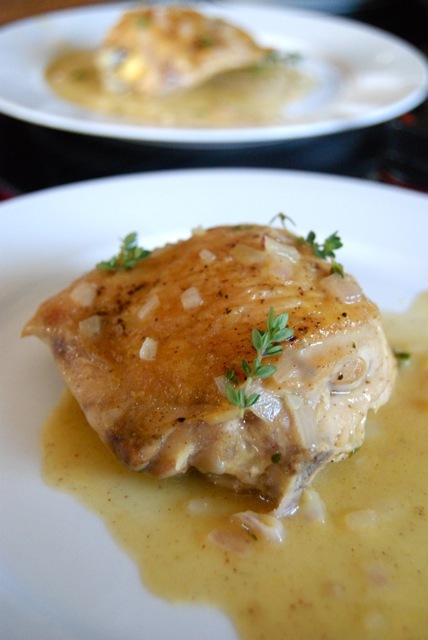 Arrange 2 thighs per plate, spooning additional sauce over top and garnishing with additional thyme. Serve immediately. This entry was posted in Main Dishes and tagged Fine Cooking. Bookmark the permalink. Aww, thanks so much for the kind words and awesome post! It really means a lot to us to hear how much our audience (and fellow cooks) enjoy Fine Cooking. Thanks for taking the time to write about your experience and send us the link. Anna and I were fans of a show called Arrested Development, where one character, Gob Bluth, would woo his girlfriend by reading menus in a ‘romantic voice’ (every item came in a ‘club sauce’). 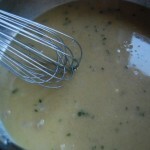 Grainy Mustard Sauce does not = Club Sauce, but simple minds, right?! Michaela – thank YOU! For taking the time to stop by and check out my version – as well as being part of the BEST cooking magazine on the planet. Keep up the wonderful work!! Great looking recipe! How do you print without photos? Tammy, unfortunately at present there’s no way to simply print a recipe card – though if I win the grant that’s something I intend to install. For now if you’d like to print, go to the share button above (between the bottom of the post and the comments) – click it and select PRINT. It will be pages long though – photos included.. Let’s hope I get the grant and can upgrade the site!! Please everyone – keep voting DAILY!